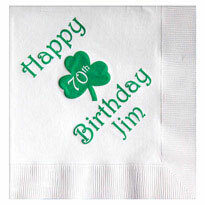 Reach out to many people without breaking your budget using custom printed promotional napkins. Choose from many styles of napkins which are ideal for a variety of occasions. We offer beverage napkins, dinner napkins, luncheon napkins, and more! 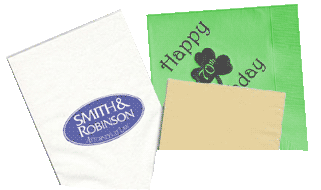 Perfect for bars, restaurants, weddings, or anywhere else, these personalized napkins can add a professional look with a low price. Get any text or graphic printed on a napkin of your choosing, including your logo or business name for a truly unique napkin.